McKesson Economy Instant Cold Pack from Incontinence Products Plus provides an instant cold compress for the temporary relief of minor pain and swelling caused by sprains, minor burns, strains, toothaches, contusions or insect bits. 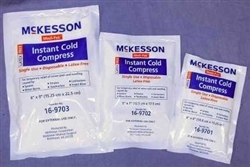 McKesson Instant Cold Packs remain cold for approximately 30 minutes after activation. They conform to body contours to help relieve swelling or pain. They are single use and disposable. Fold top to bottom to "pop" inner fluid bag. CAUTION; DO NOT REUSE. For single use only. Dispose of properly after use. Do not attempt to reuse this product by refrigerating or freezing as injury as injury or frostbite may result. WARNING: FOR EXTERNAL USE ONLY. HARMFUL IF SWALLOWED. If solution is swallowed , drink several glasses of water and contact a Poison Control Center immediately. Do not puncture bag. Check patient and compress regularly during product use to prevent leakage. discard leaking pack immediately. Should contents become exposed to skin or eyes, flush with water immediately and contact a physician. KEEP OUT OF REACH OF CHILDREN. Supervise children during use. DO NOT USE ON INFANTS. Cold therapy is not recommended for individuals with known or suspected circulatory problems, Raynaud's Syndrome or Diabetes without the consent of physician. Do not use on sensory impaired patients. Do not mix with combustible materials. Do not expose to extreme heat or open flame. Storage ar lower temperature could cause injury or frostbite after activation. Do not place on skin without using a cloth or towel for insulation. Do not use for more than 25 minutes. Store in a dry place at room temperature prior to use. CONTENTS: Calcium Ammonium Nitrate, Water.